Robust dual sensor elements securely capture web rollers up to 12" long. 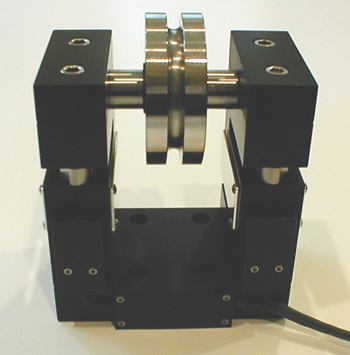 The mounting base provides a precise rigid platform to position this sensor in your material path. The roller shaft is non-rotating and held by shaft caps on each end. This makes roller installation or removal an easy process. This sensor is also available with U and V-groove rollers for robust performance in electric motor and transformer windings with tensions up to 500 lbs. Many roller material options available from anodized aluminum, steel, stainless steel, acetal/Delrin® and Nylatron®. 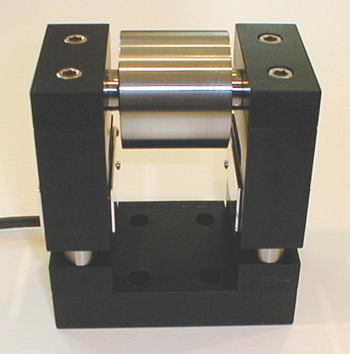 Models available from 5 lbs to 500 lbs tension, wrap angle dependent. Wrap angles may be from 30 to 180 degrees may be possible. Sensors can be calibrated to read in grams, pounds, ounces, kg, cn, newton, etc. Each sensor element is a full Wheatstone bridge strain gage transducer. They are typically commoned to create a single sensor. 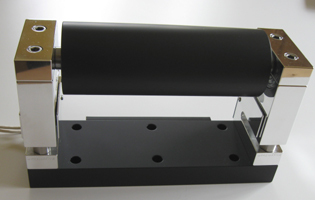 This provides excellent accuracy and consistency across the width of a web roller. The sensor elements can also be used as independent sensors where required. Give us a call at 1-800-470-3322 to discuss your application requirements. All TMI Strain Gaged Tension Transducers and Load Cells are full bridge 350 ohm or 1000 ohm sensors. They require an electronic signal conditioning module. This is typically a Digital Panel Meter with Display or Strain Gage Amplifier module. These units must provide the sensor's excitation voltage and be able to process the mV/V signal from the sensor. Click here for electronic indicator options.